A few weeks ago I was in one of my local bookstores (because it sells yarn, which is a terrible thing for a writer to say) and picked up and could not put down some gorgeous lush green Colinette wool. Then I saw some Noro sock yarn whose colours complemented the Colinette beautifully, and bought them both, and when I'd recovered from the near-heart attack induced by their collective cost I went home and started working up a hat, and hated the Noro. 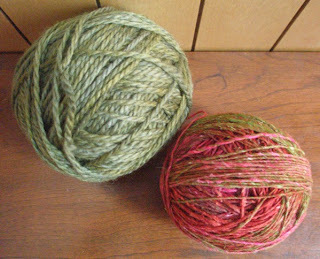 There's no comparision between these two yarns, one soft and full and the other rough and unforgiving. Especially when you knit them together on needles big enough to accommodate the expansiveness of the Colinette. However, the yarns were made to be together in this hat, and no question, the Noro's colours are a dream. So I persevered, and last night I moved on to The Embellishment, worked exclusively in the Noro. Ew. Which required tiny needles, double ew, the adorable tiny-needled Coraline designs notwithstanding. And guess what? Knit on the proper needles in the proper stitch, the Noro is sheer bliss! * I could hardly get myself to stop knitting the swatch, and boy is that saying something. So now I know what I'm doing with the rest of the ball when this hat's done: not putting it into the dreck box, but knitting with it on its own as soon as possible. * Yes, I know many people have figured that out already, and the opportunity to cluck knowingly and shake their heads without offending a soul is today's HugsForYourHead gift to them. I love a good cluck and head-shake, don't you?